“I’ll Go Crazy if I Don’t Go Crazy Tonight” was the third single used for promotion of the album “No Line on the Horizon”. The song was first delivered to radio via a digital download rather than a traditional CD release. 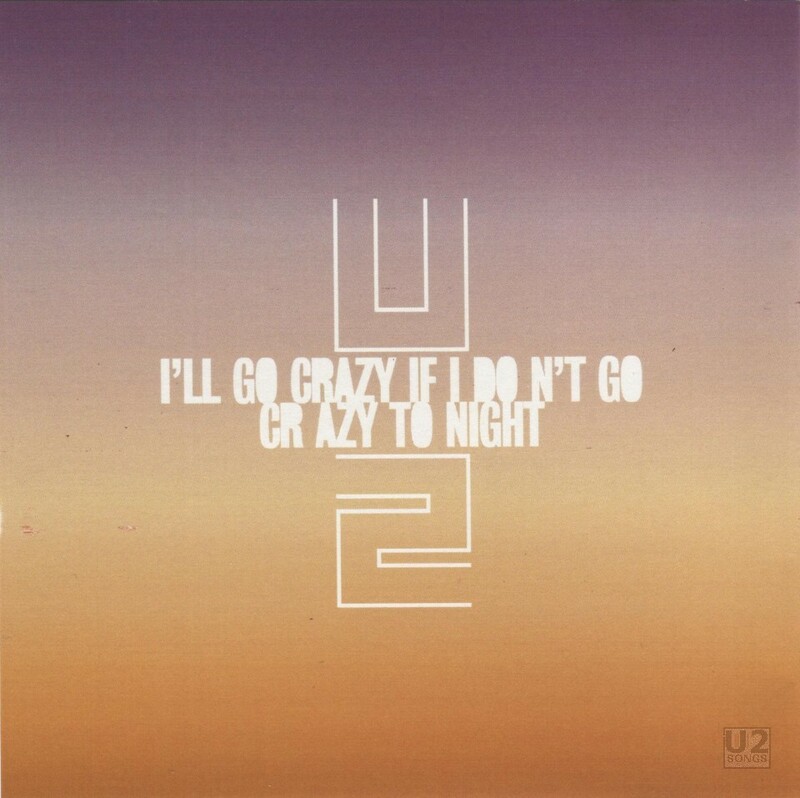 On June 12, 2009 two remixes of “I’ll Go Crazy if I Don’t Go Crazy Tonight” were released as a download pack. The two songs were accompanied with album art that was a gradient between purple and orange as you went down the screen with titles in white. The two remixes were the “Dirty South Remix” and the “Dirty South Radio Mix”. On July 6, a second download pack was issued to radio, this time including the “Radio Edit”, “Single Version”, “Dirty South Mix”, “Dirty South Radio Mix”, “Redanka’s ‘Kick Darkness’ Vocal”, “Redanka’s ‘Sparks of Light’ Dub” and an unnamed mix which turned out to be “Redanka’s ‘Kick the Darkness’ Dub”. On July 20, over a month after the initial pack, a third download pack was delivered to radio including the “Fish Out of Water Remix”, “Redanka’s ‘Sparks of Light’ Dub”, “Redanka’s ‘The Kick the Darkness’ Vocal Mix” and the “Single Version”. Between the release of these three sets of digital promos, U2 would launch their worldwide, U2360° tour in Barcelona Spain, which made use of the Redanka and Dirty South mixes of the song live in concert. They also would use the second show in Barcelona as an opportunity to film a video for the song. And in late June different promotional CDs were starting to circulate for the song. In the US, two different CDR promos were produced, both arriving in regular jewel cases, with full colour front and back inserts, making use of the cover image with the purple / orange gradient. The first of these contained the “Radio Edit” and the “Single Version”. The second CDR was subtitled on the front cover “Dirty South Mix” and contained the “Dirty South Full Mix” and the “Dirty South Radio Mix”. In the UK a 5-Inch CD was pressed, and released in a slimline jewel case, with a full colour insert also using the purple / orange cover. This CD contained the “Radio Edit” and the “Single Version”. Also in the UK a number of CDR promos circulated, featuring a small paper insert and housed in a plastic see through wallet. Some of these just contained the “Single Version” while others contained a number of the remixes. For those wondering about the differences between the “Single Version” and the version of the song that is on the album since they are close to the same length? The instrumental mix is a tiny bit different in the “Single Version” and there’s a bleep in the middle for a split second just before “baby, baby, baby”. Lyrics are the same.